Banana in syrup is one of my favorite desserts. While the delicious, shiny red pieces of banana look like candy, they are not as sweet as they appear. 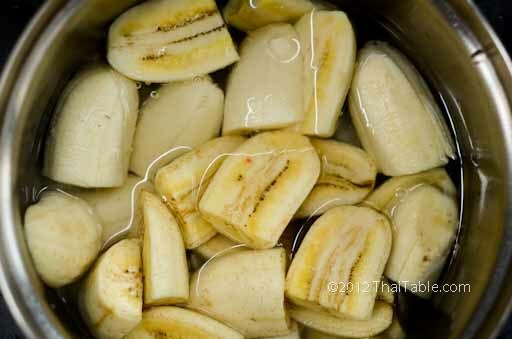 The small bananas common in Thailand called gluay nam wah(กล้วยน้ำว้า) are a key ingredient in this recipe. In the US, the closest type of banana I found was Manzano. 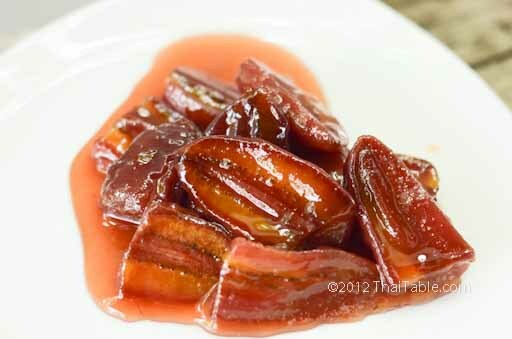 Bananas in syrup is easy to make and tastes great, but making it beautifully red does take a little patience. Limewater helps firming up the ripened banana. The most common problem is getting the bananas to turn beautifully red. The secret is patience. After an hour of cooking, the bananas start to turn red. Keep the heat low and continue to cook until all the banana pieces are red. I have tried to shorten the cooking time by adding bananas when the syrup has thickened, unfortunately, it didn't work. Depending on the ripeness of your banana. 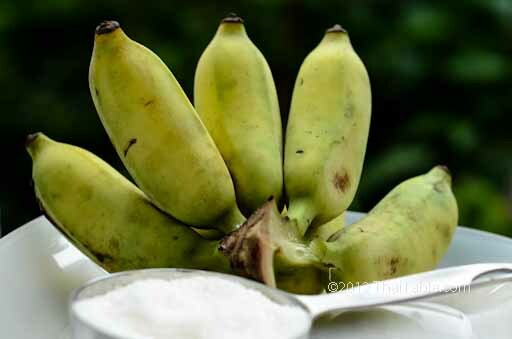 The ideal banana for this dessert is the bananas that are still greenish and hard, see the picture. If you need a knife to cut the tip to peel the bananas, it's ideal. However, if you can just pinch the tip with your fingers, the banana is ripe, you will need lime water to soak the bananas in. The lime water helps the ripened banana holds its shape during long cooking process. Peel the bananas. Cut lengthwise and cut again in half so that you get 4 pieces from one banana. 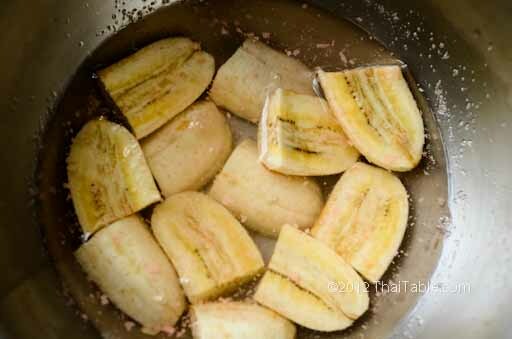 Soak in the cut bananas in lime water for 15 minutes if your banana is ripe. Add water and sugar to a pot with thick bottom. If you have a brass wok from Thailand, this is the great occasion to put it to use. The thick bottom will give even heat and prevent the syrup from burning. Let the water and sugar dissolve and form a thin syrup. Add the banana pieces. If you have soaked the bananas, drain the limewater away and rise the banana pieces in water. 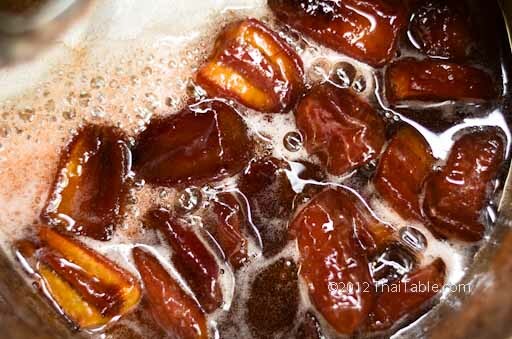 Let the banana pieces cook in syrup over very low heat for one hour to 1 ½ hour, until your banana turns reddish. Check the bottom of the pan occasionally. You don't want to stir too often as this may break up the banana pieces initially. As the bananas cook, they get harder. 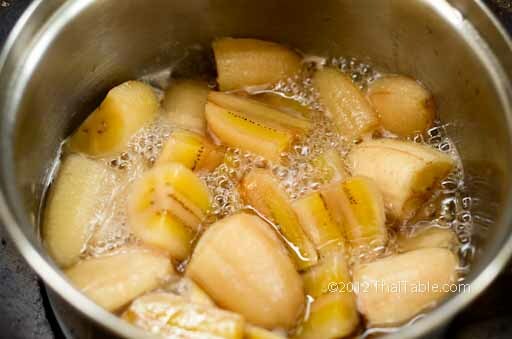 You may need to add a tablespoon of water here and there toward the end of the process as the syrup gets more concentrated. Do not cover, so you can see the process. The bananas will turn red after an hour of cooking in syrup. It will start with light pink and finally the whole piece starts to turn reddish. Good bananas in syrup should be firm but not hard, sweet but not overly sweet.